Old Testament term used chiefly by Jeremiah (vii. 31, 32; xix. 6, 11, 12, 13, 14) and once in II Kings (xxiii. 10) to designate a place in one of the valleys just outside the walls of Jerusalem. The meaning of the word is much in dispute. W. Robertson Smith ("Rel. of Sem." p. 227, note) connects it with an Aramaic loan-word which means "fireplaces." The formation of the word is similar to that of "Molech" and "Ashtoreth." The passage in Kings locates the place in the valley of the son of Hinnom. Now there are three valleys in Jerusalem which converge just below the pool of Siloam: Kidron from the east side of the city; Wady al-Rababi from the southwest; and the Tyropœon extending from the Jaffa gate to Siloam. There is no consensus of opinion as to which of these valleys represents the ancient Tophet. There is, however, agreement that the convergence of the three valleys marks a part of Tophet. It is also very generally agreed that Tophet did not extend up the valley of the Kidron on the east side of Jerusalem. 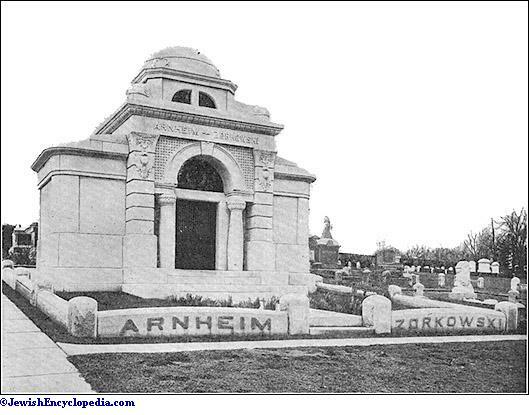 It is to be connected, then, either with the Tyropœon depression or, preferably, with the great valley marking the southwest border of the city. 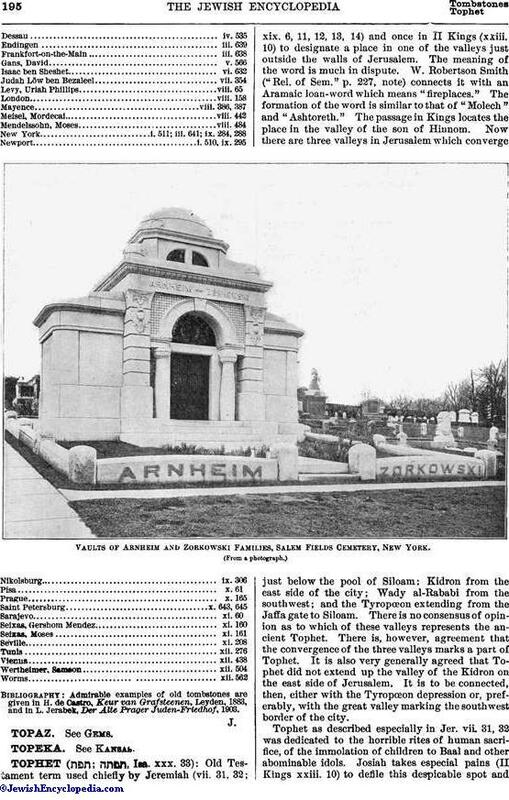 Vaults of Arnheim and Zorkowski Families, Salem Fields Cemetery, New York. Tophet as described especially in Jer. vii. 31, 32 was dedicated to the horrible rites of human sacrifice, of the immolation of children to Baal and other abominable idols. Josiah takes especial pains (II Kings xxiii. 10) to defile this despicable spot andthus to put a stop to the atrocious sacrifices of human life which had been made by at least two kings of Judah. Jeremiah's references to Tophet characterize it and at the same time specify that the punishment which threatens rebellious Judah shall so revolutionize and reverse current wrongs as to fill this valley with the corpses of those who shall be slain in the impending calamities. Tophet shall henceforth be called "the valley of slaughter" (Jer. vii. 32). 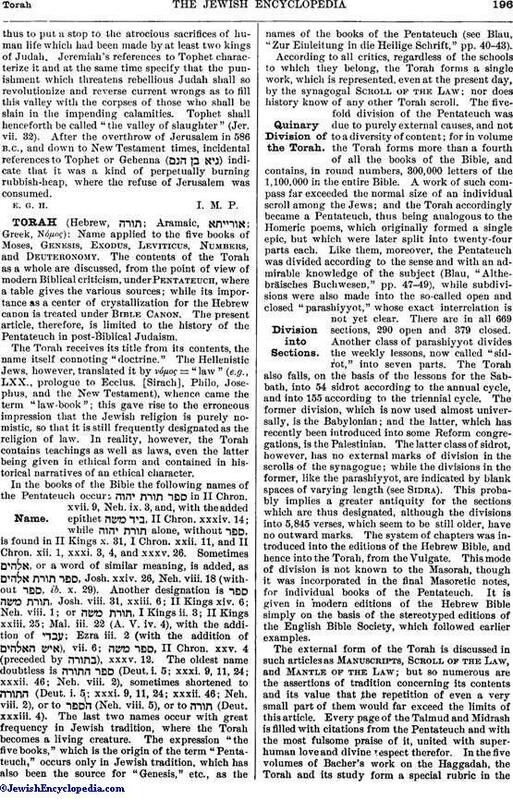 After the overthrow of Jerusalem in 586 B.C., and down to New Testament times, incidental references to Tophet or Gehenna ( ) indicate that it was a kind of perpetually burning rubbish-heap, where the refuse of Jerusalem was consumed.